Obsolete term for a relatively rare malignant neoplasm of the ovary and corpus uteri, thought to originate in mesonephric structures that become misplaced in ovarian tissue during embryonic development; characterized by a tubular pattern, with focal proliferation of epithelial cells with clear cytoplasm or of the hob-nail type; so-called glomeruloid structures are reported, that is, small convolutions or tufts of tiny tubate formations with capillaries extending into the spaces. 1 a malignant tumor of the tubular epithelium of the kidney. Characteristically the malignant cells contain abundant clear cytoplasm. See also renal cell carcinoma. 2 an uncommon ovarian neoplasm characterized by cells with clear cytoplasm. A rare malignant neoplasm of the ovary and corpus uteri, thought to originate in mesonephric structures that become misplaced in ovarian tissue during embryonic development. Synonym(s): clear cell carcinoma, mesometanephric carcinoma. Clear cell carcinoma of the cervix may be positive for p16 despite lack of detection of human papillomavirus in this tumor type (hematoxylin-eosin, original magnifications X100 [A], X400 [B], and X200 [C]; original magnification X200 [D]). Thromboembolic complications in patients with clear cell carcinoma of the ovary. The absence of cytologic features of clear renal cell carcinoma, such as large clusters of cells with abundant clear to finely vacuolated or granular cytoplasm, many stripped nuclei, centrally located nuclei, prominent nucleoli, more uniform nuclear size, lacking perinuclear clear zone, and the positive CK7 in these cases and negative vimentin, excluded clear cell carcinoma. 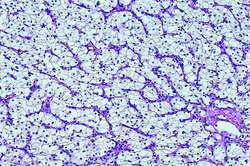 Immunohistochemical analysis of clear cell carcinoma of the gynecologic tract. The most common histological subtype present in our population was clear cell carcinoma which was identified in 37 (74%) of the tumours. Clear cell carcinoma of the urinary bladder has also been referred to as (a) mesonephric or mesonephroid carcinoma or (b) adenocarcinoma of the urinary bladder . Clear cell carcinoma, the rare vaginal cancer associated with DES, has been found in girls as young as 8. G250 targets and binds to clear cell carcinoma and reacts against an enzyme present in 94 percent of cases. Curtin and associates at NYU consider conservative therapy if a confirmative dilatation and curettage hysteroscopy performed under general anesthesia points to early-stage, low-grade disease without evidence of stromal, papillary serous, or clear cell carcinoma. Frequent expression of napsin A in clear cell carcinoma of the endometrium: potential diagnostic utility. There was no papillary structure, areas of clear cell carcinoma, or sarcomatoid pattern.